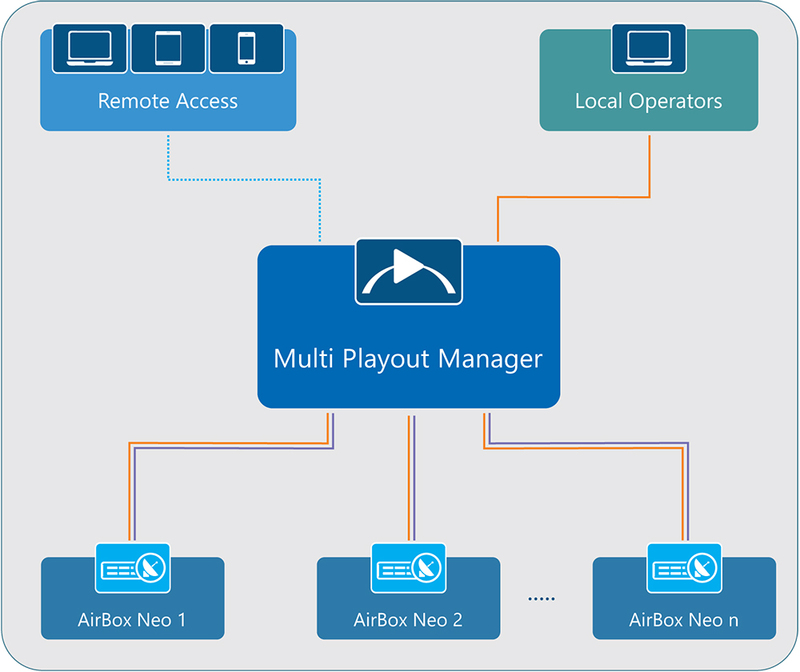 Multi Playout Manager (MPM) is a fully assignable monitoring and control system with rights management for multiple AirBox Neo channels from one or more internet-connected PC`s locally or from anywhere in the world via IP. MPM is a networked workflow solution created for multi-channel playout centers to monitor and control all channels locally and assign full or restricted user rights for any of the TV channels to one or more people to remotely monitor, control and view the TV channels from PC or Mobile Device. MPM allows multiple operators with sufficient rights to monitor, control and view one or multiple channels schedules, programmes, media files and etc. and to even make live changes to the output when needed. MPM can be used in a simple or complex network infrastructure complete with full redundant operation when required. Clip Trimmer to assign In/Out points, Clip Properties Editing and etc.